[S432] Samuel M. Alvord, Alvord, Page 272. [S432] Samuel M. Alvord, Alvord, Page 148. [S432] Samuel M. Alvord, Alvord, Page 88. [S432] Samuel M. Alvord, Alvord, Page 56. [S436] Burton W. Spear Mary and John 7, Page 163. Thankful Atherton was the daughter of Humphrey Atherton and Mary Wales. Thankful Atherton married Thomas Bird Jr.
Thomas Bird Jr. married Thankful Atherton, daughter of Humphrey Atherton and Mary Wales. 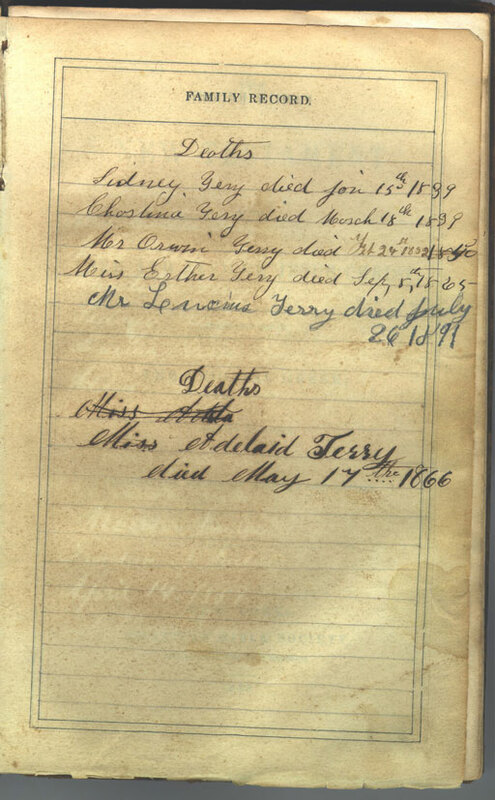 Lucius and Nancy were enumerated in the 1880 Windham, Windham Co., CT, federal census. He was a painter age 38, she was 36. The only child in the household was Caroline, 8. Frank and Caroline were enumerated in the 1920 College Hill, Beaver Co., PA, federal census. He was a steam fitter, age 56, she was 48. Daughter, Eleanor L. and her husband William J. Reed were also in the household, as was widowed mother-in-law, Nancy Terry, age 75. Frank and Carrie were enumerated in the 1930 Beaver Falls, Beaver Co., PA, census, living at 3231 College Avenue. He was 65, she was 58. Daughter Eleanor 37 and husband William Reed 39, were also in the household with mother-in-law, Nancy Terry, now 86. Frank A. Shattuck, aged 84 years, died Friday afternoon in his home, 3231 College avenue, after an illness of two months' duration. Born in Chicago, Ill., the deceased had lived in this community for the past 58 years. Mr. Shattuck retired two years ago after 35 years' employment with the Ingram-Richardson Manufacturing company as a watchman. He was a member of the Christian church of Beaver, and a charter member of the Knights of Malta. The deceased leaves his widow, Mrs. Carrie Terry Shattuck; a son, Albert L. Shattuck, Massillon, O; one daughter, Mrs. William Reed, at home, four grandchildren and four great grandchildren. Friends will be received after 7:00 o'clock this evening in the A. D. Campbell funeral home. 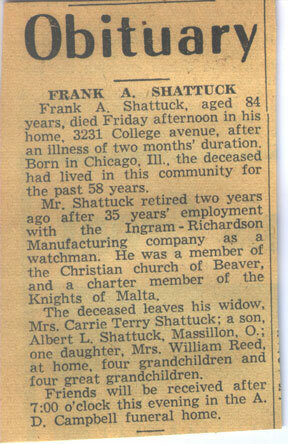 Frank A. Shattuck was born circa 1863 at Chicago, Cook Co., IL. He married Caroline N. Terry, daughter of Lucius Terry and Nancy M. Hinman, on 15 February 1888 at possibly Port Chester, Westchester Co., NY.1 Frank A. Shattuck died say 1947 at probably Beaver Falls, Beaver Co., PA.
[S182] Social Security Death Index (on-line), Ancestry.com, SSDI, Ancestry.com, SSAN 298-03-9349. Nellie Louisa Shattuck was born on 8 July 1892.1 She was the daughter of Frank A. Shattuck and Caroline N. Terry.1 Nellie Louisa Shattuck married William Reed. William Reed was born circa 1891 at OH.1 He married Nellie Louisa Shattuck, daughter of Frank A. Shattuck and Caroline N. Terry. Elizabeth Stoughton was baptized on 28 February 1613 at Coggeshall, Essex, England.1 She was the daughter of Thomas Stoughton and Elizabeth Montpesan.1 Elizabeth Stoughton was buried on 15 July 1619 at Coggeshall, Essex, England. b. 29 October 1615, d. probably d.y. [S436] Burton W. Spear Mary and John 7, Page 167. [S436] Burton W. Spear Mary and John 7, Page 164. [S135] Judge Oliver Seymour Phelps Phelps Family, page 1304. Children of Eunice Bissell and John Stoughton Jr.
[S432] Samuel M. Alvord, Alvord, Page 38. [S432] Samuel M. Alvord, Alvord, Page 36. [S432] Samuel M. Alvord, Alvord. [S439] Robert Glenn Thurtle, Colonial Governors, Page 2. Josephus Messenger was born circa 1794. He was the son of Lemuel Messenger and Abigail Lampson. Josephus Messenger married Betsey Day circa 1817. Josephus Messenger died in February 1834.